On December 14, 2014 a specialist in archaeology published an article on further excavations of a temple complex at Telhara, Bihar, India. IANS put in online. 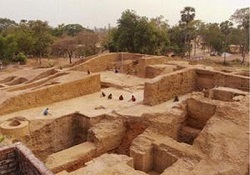 The hastily reached conclusion after a new successful dig was that here are the remnants of a Buddhist university that well could predate those of Nalanda and Vikramashila, equally in Bihar. The conclusion was reached after archaeologists discovered four terracotta plaques with the inscription “Sri Prathamshivpur Mahavihariyaye Bikshu Sanghas“. This was seen as proof of the “universityness” of the dig at Telhara. The conclusion was reached on the basis of the word Mahavihar… (great vihára). As the Nalanda university too bears the name of Mahávihár(a), “Mahávihár” has come to be recognized as “university”. Actually a Mahávihára is merely a sizeable monastery. As all big monasteries (mahávihára) offer some kind of schooling and training, it is not a given that each Mahávihára is therefore a university, i.e. an educational facility that offers a range of different subjects to study. This conclusion is too hastily drawn and does not seem to be corroborated by litterature or literary findings on the spot. If we would lay out the words on the newly dug-up plaques we first have to consider the word “Sri” (sometimes Shri). This word, that stands for something like saintly wise man, does not occur in the dictionaries of classical Sanskrit. It might therefore be somewhat younger than the oldest vedic texts of Hinduism. Next we have Pratámshivpur. Prathám is a word that appears in the Hindu Upanishads, a collection of texts that follows on the earliest veda. In particular the Swetasvatara Upanishad, belonging to the Krishna-Yajurveda, has the word “prathám” twice, in mantra 1 where it is used to indicate the Great Self, and in mantra 13 where it is used to laud the “perfect yoga”. Hence it is not in the Upanishads that we find the meaning of Pratámshivpur. The dictionary of classical Sanskrit given “práthama” as “first”, and “foremost”. “Shiv” is short for the Hindu god Shiva, and the suffix “-pur“, or “-pura” indicates a town, or more broadly, human habitation. Therefore Sri Pratámshivpur means “the foremost town where Sri Shiva is venerated“. As Bikshu Sanghas (generally one reads bhikshu (Skr.) or bhikkhu (Pali)) is translated as the congregation of monks, the entire line of “Sri Prathamshivpur Mahavihariyaye Bikshu Sanghas” must be translated with “the great monastery (belonging to) the monks congregation at the foremost town where Sri Shiva is venerated“. The plaques do not speak of university. Of course they don’t, since the classical Sanskrit doesn’t know yet the institutionalized teaching under the supervision of an acárya or group of acárya (teacher). In the old days everything was still fluid. Groups of teachers (acárya) flocked together in temples (vihára in the case of the Buddhists) or ashrams (in the case of the Hindus) and students, adhyáyin in the case of students of the veda, went from one acárya to another until all subjects were mastered. Again, in order to establish whether the Mahávihára at Sri Pratámshivpur was a “university”, one first needs to dig up texts that either served as teaching material or in which is mention of acárya or students, sekha or sekkho in the case of Buddhists who study the Small Vehicle canon. This, the all-encompassing atmosphere is what in East-Asia is captured under the word “soul”. We immediately are aware of the fact that soul East and West are different things. East feels compelled to rise up to this atmosphere, this soul, in order to completely blend in, thereby finally experiencing absolute harmony. West considers soul to be an individual property of an individual being, born with the being, and dying with the being. Similarly the self East and West are concepts that have rather different backgrounds and connotations. An Egyptian intellectual once explained that in the Islamic sense of the word “self springs from the mind of Allah”. In this line of thought therefore, self is not an individual entity belonging to an individual being, but rather it is a emanation of Allah’s mind, and man is invited to live up to this lofty ideal. Ven. Haeju is the writer of the texts in Volume 4 of the Korean Jogye Order’s manuscripts. This Volume 4 (Hwaom-1), translated by Richard D. McBride II, has a surprising view on the subject of self as postulated by Hwa’om Master Uisang (625–702). (The Korean Hwa’om is the Chinese Huayen or, translated, the Flower Garland, the title of the most voluminous canonical text of the Mahayana). Ven Haeju explains in note 40, page 18, how “the basis of all conditions are the self”. Mr. McBride mistakenly translates “self” with the Indian word “atman“. But when we look up “self” in the Korean dictionary, we see that it never really is a stand-alone as it is in Western philosophy. We come accross a Korean self in “annihilation of self”, but it has to be understood as a physical process as in “I beat myself over the head”. Other lemmas in the English-Korean dictionary are, for instance, about “self-control”, confidence in oneself (given als “self-reliance”), self-discipline and so on. Ven Haeju continues by saying that the basis of all dharmas (phenomena) is the mind. Or to give the complete passage: “the basis of all conditions are (is) the self, and the basis of all dharmas are (is) (the) mind….” Hence that which underlies our acting and thinking in the ordinary sense of sending emails and shopping for clothes is the psycho-physical complex, the self. And that which underlies all dharmas (phenomena) is Mind, an ultimate, and Mind is non-self or beyond self, or prior to self. To turn to the south-Asian concept of the self: In Thai parlance the composite “win yan” is translated as “self”. On closer examination “win yan” is a process of introspection: that which is going on in one’s mind is “win yan“, and as Siamese philosophy is deeply rooted in Buddhism, “win yan” therefore is fleeting, therefore ungraspable and insubstantial. The Pali-word ajjhattarato is used. The post-canonical Dhammapada says that here is a monk who takes pleasure (rato) in introspection (ajjhatta). The Thai and Buddhist win yan, respectively ajjhattarato is therefore the complete opposite of what the West considers to be the self. Western philosophy has it that “self” is a during, rather unmoving, unchanging and totally individual entity. South-Asia says that it changes as the person changes in moods and preferences. It therefore cannot be grasped, which explains how the Asian, Buddhist or otherwise, has hardly any difficulty with concepts such as non-self and the insubstantial, whereas the Westerner has to make an immense effort to unlearn the philosophical and psychological self-concept as being the only thing a person can truly rely on during his/her life in the here and now.